David Bowie will forever be an icon of the rock and roll era. His music, showmanship, and dedication to his art were rarely paralleled and his successful recording career touched six decades. Often forgotten, though, is Bowie's prolific and lauded acting career which took a giant leap with his starring role in The Man Who Fell To Earth. 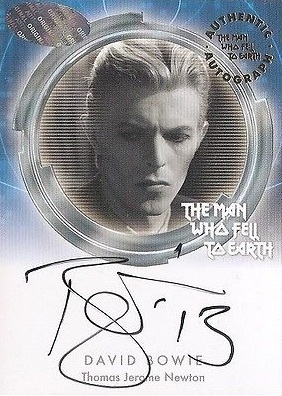 2015 The Man Who Fell To Earth trading cards chronicle the sci-fi tale with a full release. Based on the Walter Tevis novel of the same name, The Man Who Fell To Earth features David Bowie in the role of Thomas Jerome Newton, an alien searching for water to bring back to his home planet. 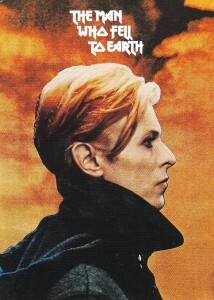 The film, which has become a cult hit and is ranked favorably among critics, earned Bowie a Saturn Award for Best Actor. In 2015, UK-based manufacturer Unstoppable Cards released a product to commemorate this classic film. Much like the Rittenhouse releases in the United States, Unstoppable Cards issued the product in a very limited quantity — boxes are individually numbered — and has completely sold out their stock. Luckily for collectors of Bowie, science fiction, or British pop culture, there is an active secondary market for this set, including the occasional unopened hobby box. The base set of 54 cards includes color stills from the film on the front as well as black-and-white images on the rear. Collectors should be able to pull one complete base set out of a typical box and possibly two. 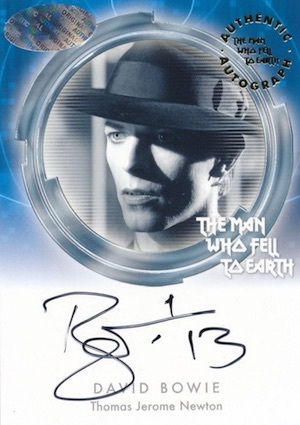 In addition, there is a Gold Foil puzzle chase set of nine cards, as well as Sketch and Film Cel cards, but the crown jewel of this set is the five Autograph cards, two of which are of David Bowie. These cards are incredibly rare and their value is skyrocketing in the wake of Bowie's passing as there are only 50 of each of card. 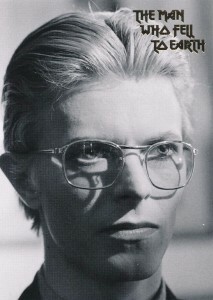 The two Bowie autographs combine to average one per case. As is the norm for sets like this, there are a number of artist-submitted sketch cards to be found, although they are more rare than the autographs and are not guaranteed per box. There are several promo cards and various printing plates as well. Also like most entertainment releases, custom binders can also be found but they are limited to just 199 copies and contain two promo cards. Because of the generous collation of cards, base sets are pretty easy and inexpensive to come by online. 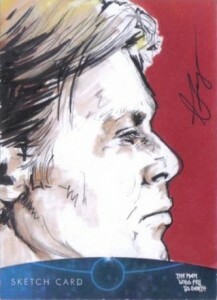 Sketch cards, particularly those featuring David Bowie, are generating a much higher asking price and the Bowie autograph cards were already fetching several hundred dollars prior to his passing and will, likely, increase in value at a steady rate as collectors clamor for his memorabilia. If your only knowledge of Bowie's acting is his role in The Labyrinth, go seek out this film. 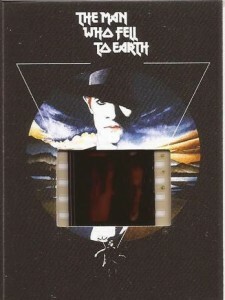 Blu-ray and DVD copies can be found online for reasonable prices and once you have a better understanding, track down this card set as a tribute to the Thin White Duke. 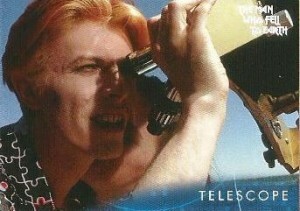 The Man Who Fell To Earth Film Cell Card Featuring David Bowie as Thomas Newton. 5 cards. 1:24 packs. Casey has inscriptions. 6 cards. Available separately. Issued in 2013. 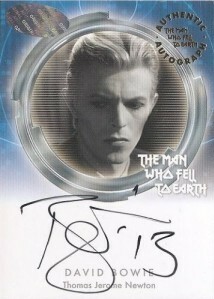 DAVID BOWIE - The Man Who Fell To Earth - Binder & Trading Card lot + Autograph!